Since 1991, numerous studies have shown that injectable contraceptives like Depo-Provera may increase women's risk of contracting HIV. The World Health Organization (WHO) has now changed its recommendations on certain injectable contraceptives in light of mounting evidence and increasing concern. Many recent studies have also explored possible biological explanations for why medroxyprogesterone acetate (MPA), the active ingredient in injectable contraceptive like Depo-Provera, may increase the risk for HIV transmission or viral replication. Yet despite mounting evidence and a new category 2 recommendation on these drugs, the WHO continues to recommend the use of injectable contraceptives under most circumstances, including for women at high risk of contracting HIV. The new guidance statement comes after a WHO technical consultation meeting convened last December to allow the Guideline Development Group (GDG) to discuss recommended policy guidelines for hormonal contraceptives in the context of high HIV transmission. After reviewing the evidence (as they already had done on previous occasions in 2007, 2012, and 2014), the GDG, for the first time, changed the recommended eligibility criteria for progestin-only injectable contraceptives for women 18-45 years of age from medical eligibility criteria (MEC) category 1 to MEC category 2. The new guideline will apply not only to depot-medroxyprogesterone acetate (DMPA) -based injectable contraceptive drugs like Depo-Provera, but will also apply to norethisterone enanthate (NET-EN) injectables as well. Until now, the WHO had recommended that injectable contraceptives could be used with "no restrictions…including DMPA for women at high risk of HIV (MEC Category 1)." 4 , 5 The WHO had maintained a "MEC category 1 with clarification" on progestogen-only injectables. This meant that women at risk for HIV could use these injectables without restriction but should have been counseled that injectables "may or may not increase their risk of HIV acquisition" 6 and should have been provided with condoms and counseling about how to reduce their risk for HIV transmission. While the WHO specifically mentions condoms as a "prevention strategy" against HIV, abstinence (the only one-hundred percent reliable prevention strategy against HIV) is never mentioned once. In one particularly well-known study 7 conducted in Rakai, Uganda, inconsistent condom use was not found to significantly reduce the incidence of HIV. Given that condoms have a high failure rate and are often used inconsistently, recommending condom use instead of abstinence is potentially problematic. The GRG, no longer able to ignore the evidence, has clearly moved in the right direction. The new category 2 MEC on injectables will slightly improve procurement policies for injectables. But in general, not much has really changed. Like the former guidelines, the new guidelines simply recommend that women should be informed that there is "uncertainty" as to whether injectable contraceptives in fact cause women to be more susceptible to HIV. 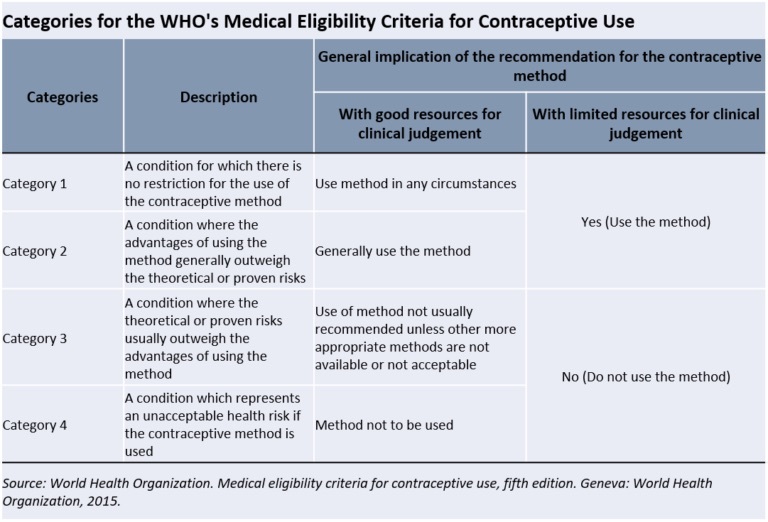 This directive is a rather curious as nothing else like it appears anywhere else in the WHO's Medical Eligibility Criteria for Contraceptive Use (MEC). Typically, when health risks of using a contraceptive method (or any drug really) are merely theoretical, based on conflicting evidence, or based solely on observational studies (like DMPA), patients are simply informed that possible risk exists. Despite the fact that uncertainty exists with a number of health risks listed in the MEC, nowhere else in the MEC is there a specific recommendation that patients be told that uncertainty exists about the drug's risk as there is with progestogen-only injectables. With Depo and other injectables, patients are told at one and the same time that injectable contraceptives may increase their risk for HIV and that the risk of contracting HIV with injectables is uncertain. It would seem that the juxtaposition of these statements would constitute an attempt to sway women's opinions in favor of accepting injectable contraceptives despite the associated risks. Injectable contraceptives are among the most popular contraceptives used in Sub-Saharan Africa where, across much of the region, the risk of contracting HIV is high. In a number of Sub-Saharan African countries, non-medically licensed community health care workers (CHWs) are permitted to administer injectable contraceptives. Because CHWs lack sufficient training or resources to make clinical judgements, changing the recommended MEC from category 1 to category 2 means very little. The WHO recommends that drugs should be used under conditions listed as category 1 or 2 when CHWs, and others who lack the ability to make clinical judgements or prescribe HIV prophylactic drugs, are administering them. The WHO maintains that "a category 2 recommendation is not, however, intended to suggest that women at high risk of HIV be denied the use of progestogen-only injectables because of potential concerns." 9 The WHO bases this premise on the assumption that the risks of high maternal mortality in developing countries following an unintended pregnancy outweigh the risks of contracting HIV. However, pregnancy is not a disease nor is maternal death the necessary consequence of an unintended pregnancy. Maternal mortality is not caused by a lack of injectable contraceptives. Rather, maternal mortality is caused by a lack of health interventions such as prenatal care, and the treatment and management of pre-eclampsia or postpartum hemorrhage, just to name a few. If we're really concerned about reducing maternal mortality, perhaps we should instead reinvest the millions of dollars spent every year on procurement of injectable contraceptives to areas with high prevalence rates for HIV to real health interventions like attended birth, which is the most important intervention in reducing the number of maternal deaths. Women who are medically indicated to benefit from spacing or postponing pregnancy should also be empowered to do so through fertility awareness methods such as abstinence and lactational amenorrhea. The WHO's recommendation that injectable contraceptive drugs be administered freely to women at high risk of contracting HIV is contrary to women's human rights. The WHO's MEC category 2 will do little to mitigate the potential harm that women using these drugs could face if injectable contraceptives do in fact increase women's risk for contracting HIV. Until injectable contraceptives like DMPA and NET-EN can be proven safe, they should not be given to women who are at risk for an HIV infection. Meanwhile, the Depo deception continues.